Our visit to Walt Disney World in 2017 fell in between Hurricane Irma and Hurricane Maria. Orlando broke several heat and humidity records during our visit, and we undeniably felt the heat. The humidity levels were at or above 75% a good portion of every day. We were begging for water at every turn and guzzling ice cream that melted into a puddle before we took the first lick. 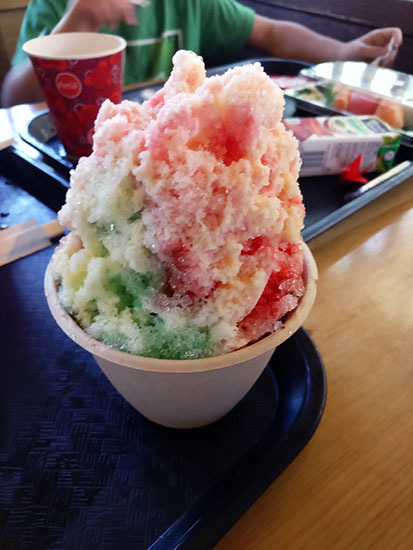 While we checked out the sushi offerings at Katsura Grill (check out our #stinkydiaper review), the kids cooled down with a Rainbow shave ice from Kabuki Cafe in the air conditioned dining room of Katsura Grill. The Kabuki Cafe is an outdoor kiosk that offers some menu crossover with Katsura Grill. Kabuki Cafe offers a selection of small sushi rolls, alcoholic and non-alcoholic drinks, and shave ice. The service here is fast and the line moves quickly. The shave ice comes in several fruit flavors and also in sake infused with tropical flavors. Shave ice actually originated in Japan, if you didn’t know. It is called Kakigōri. Japan has super cool history; prior to 1934 when the first automatic shave ice machine was made, the Japanese people would use swords to shave the ice off large blocks. Selections are offered in just one size, but it’s fairly large. Rainbow is comprised of 3 flavors: strawberry (red), tangerine (orange), and melon (green). It’s $4 and can be redeemed as a snack credit on your Disney Dining Plan. Outside the kiosk you can find the Japanese International Food and Wine festival snack options including a Salmon BLT sushi roll for $7.95, but if you want the condensed milk topping on your shave ice, it’s an additional $1 – not covered. On a hot Florida sunny day, this was the perfect treat! We loved all the flavors, and thought they were especially good all combined! ► For Kids: The Kabuki Cafe Kakigōri is a great treat! Kids will love the bright colors and bold flavors, plus it will cool them down and provide temporary relief from the insane humidity. Have you tried the shave ice at Kabuki Cafe? Though the offerings were slim, we thought it rivaled, Ululani’s Hawaiian shave ice in Maui. To be fair, anything cold would have tasted amazing in that hot hot heat so our review may be slightly skewed. 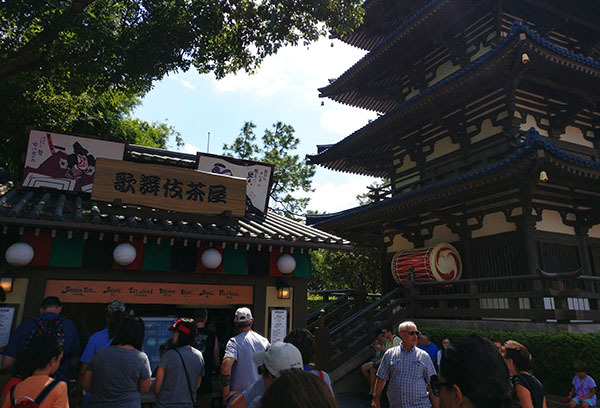 ► Nap-Time Version: Great shave ice at Kabuki Cafe in the Japan World Showcase in Epcot at Walt Disney World. 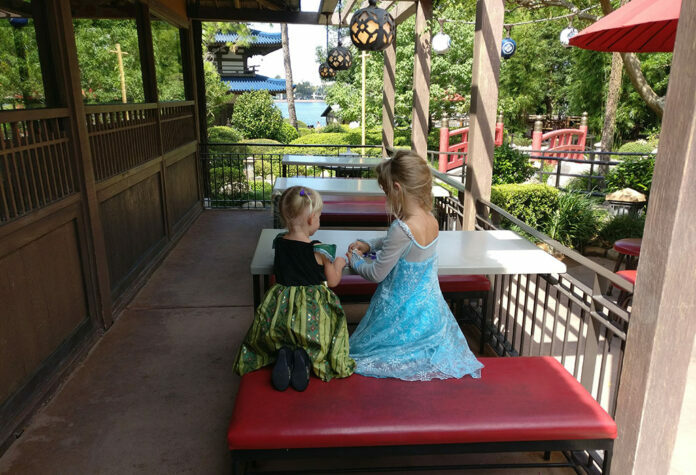 Check out our reviews of Katsura Grill, Teppan Edo and Tokyo Dining – all located in the Japan Pavilion in Epcot, and when you’re done there check out our full Ttable of Contents of Walt Disney World Restaurants.